… begins with purchasing a treadmill. Which I have just recently done and installed as the main part of a walking desk. I have been noticing for a while now that my writing output has been dropping off. At first, I chalked it up to my move last summer, and then my change in focus from short fiction to novellas and novels, but in terms of words written it’s just not even close to what I was doing two years ago. I’m coming to think that my general loss of fitness in the last year has had a larger effect than I thought. I’ve been tired and sluggish, and it shows. I’ve been spending a (tiny) bit more time in the gym, which has helped the sluggishness, but itself consumes time. 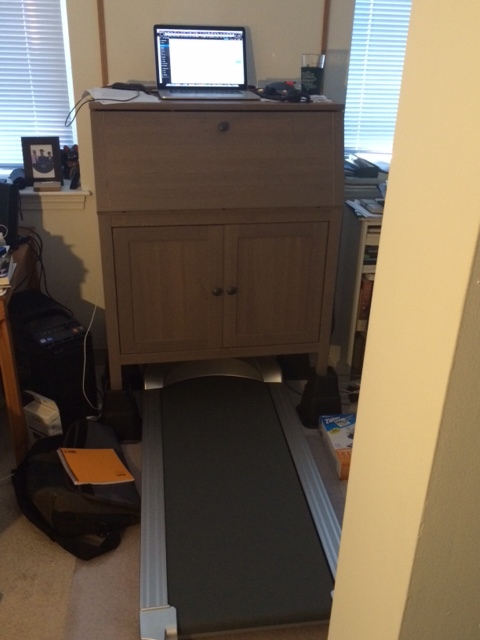 I’d been reading and thinking about walking desks for a while now, and after some experiments in reading and playing video games on the gym treadmill to confirm that I could concentrate and interact with something complicated, I bit the bullet. The treadmill is a Rebel 1000, and so far I’ve been very pleased with it. The desk is an IKEA Hemnes secretary, which I had already been using as a standing/sitting desk; I put it on bed risers, which put the top maybe an inch above optimal height for typing on my laptop, and a few inches too high for a desktop keyboard (which it is anyway too shallow for). I just hung a whiteboard behind it, and will be pushing up against the wall a bit more to use that more comfortably. My plan is to use this setup for a month or so to a) make sure I actually am able to use it in the long run before I invest in more bulky/expensive furniture, b) get a good feel for what I need out of it in terms of height and surface area, and c) make sure that this is really where I want this furniture to live. Since the treadmill arrived about two weeks ago, I’ve been progressively spending more time on it while working and web-surfing and so on. I’m at the point where I can generally walk for an hour or so without noticing that I’ve been walking that long. My ideal walking pace seems to be about 1.1 mph, though speeding up and slowing down for brief periods can help break things up a bit. According to my Fitbit (attached to my sock, since having my hands/wrists on the keyboard tends to deaden the jostling its accelerometer needs to detect footfall at my waist) I had been averaging 5000-6000 steps per day (2-2.5 miles) and since then about 8000 per day (> 3.5 miles). My hope is to get that average to about 5 miles per day during the week. As to writing, my hope is that I’ll generally have more energy, as I used to when I more regularly went to the gym, and that by getting some of my exercise while I work I won’t have to decide between exercise and writing in the evenings. Either way, I’ll make a note to update in a month or so.